Wheat and dairy producers could be the big winners in the new North American trade deal. The deal, announced earlier this week, changes provisions for auto manufacturing and intellectual property, but keeps many of the former NAFTA provisions for agriculture. That’s one of the reasons why Joe Maxwell, executive director of the Organization for Competitive Markets, finds the proposal disappointing. His group advocates for independent family farmers. He said if Congress approves this deal, only multinational agribusinesses like Cargill or JBS will be able to lodge trade complaints, such as accusing one of the countries of unfairly subsidizing its farmers. “Continuing to give private corporations the ability to bring a dispute actually puts the farmer in harm’s way,” he said, adding that he believes agribusinesses will act in their own interests and there isn’t a mechanism for independent farmers to advocate for themselves. Maxwell says the deal would also undercut bipartisan congressional efforts to put a moratorium on large agribusiness mergers and leave too much authority in the hands of the World Trade Organization. But there’s a possible boon for wheat growers in states along the border with Canada, which will be required to treat U.S. wheat the same way it treats its own. “It would be a big step forward to make this much more fair for U.S. farmers along the border to sell their wheat into Canada,” said Steve Mercer, vice president of U.S. Wheat Associates, which advocates for exports on behalf of state wheat-growers associations. Mercer said the deal also could help restore Mexican confidence in U.S. agricultural products, as it “preserves the duty-free access and ends the renegotiation.” He added that Mexican imports of U.S. wheat are down about 25 percent this year, which he attributes to Mexico’s concerns about ongoing trade disputes and in particular President Trump’s use of tariffs for leverage. Dairy could also be a winner, as Canada agreed to some changes that should allow U.S. farmers to expand their exports of milk, cheese and other products, after some tough years, especially for New York and Wisconsin dairies. Some beef industry leaders fear they may lose out under the new deal. Bill Bullard, is the CEO of the Ranchers-Cattlemen Action Legal Fund United Stockgrowers of America, and is a former rancher. He was one of severalindustry leaders who called for NAFTA renegotiations to include country of origin labeling. The U.S. Department of Agriculture did away with the regulation in 2015 after persistent complaints from Canada and Mexico. Since then, meat that is raised in Mexico and Canada can be labeled as a product of the U.S., as long as it’s slaughtered or packaged in this country. Bullard said the labeling system is deceptive to consumers who think they’re purchasing a U.S.-made product. He also argued that the labeling system undermines U.S. cattle producers, who are forced to compete with cheaper imports from Canada and Mexico. “We are very disappointed that the administration has missed a huge opportunity to help rebuild and strengthen our U.S. cattle industry,” he said. But in a news release,the National Cattlemen’s Beef Association, which represents many ranchers and the large meatpackers, said the new deal was a success because the free trade gives producers access to foreign markets. The National Farmers Union echoed the disappointment over labeling. But President Roger Johnson issued a statement saying that the deal, while no panacea, would help to repair strained trade relations between the three countries. “Progress was made on the dispute settlement mechanisms,” the statement said, but they still concentrate power in the big corporations. Congress will need to approve the deal before it can be finalized and implemented. Harvest Public Media reporter Esther Honig contributed to this report. Back in 2012, one of the major employers in Montrose, Colorado, a sawmill, was in receivership and on the brink of collapse. At the time, local media reported that the cost of logging timber had become prohibitively expensive, and the log yard was nearly empty. These days, logs are stacked high next to a humming mill. Production is up 20 percent from even just 2016. 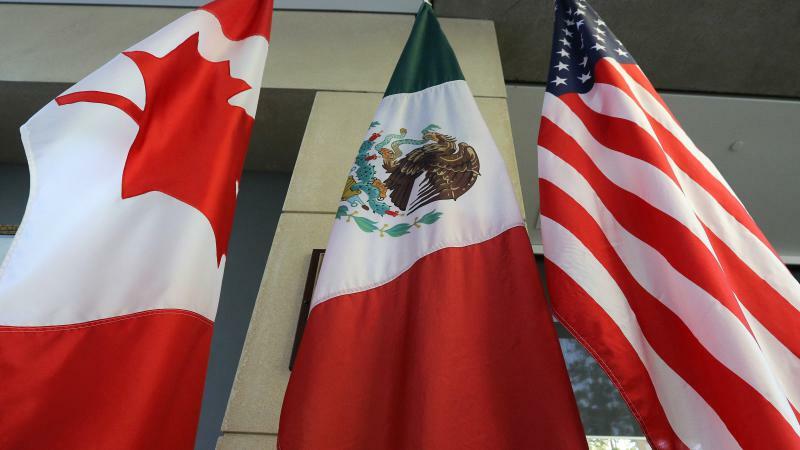 The United States and Mexico have reached an "understanding" on several critical trade issues following bilateral talks to renegotiate the North American Free Trade Agreement. They will now likely re-engage with Canada to reach a final deal on NAFTA, a primary goal of the Trump administration. Speaking at the White House on Monday, President Trump said he wanted to change the NAFTA name to the U.S. Mexico Free Trade Agreement. He also reframed the negotiations as two bilateral trade deals.